When are deer mostly on the move? Dawn and dusk. They have great night vision, and that makes them elusive creatures for the human who’s drifting into deep slumber come low light. Come hunting season, and everyone’s ready to do a little more prep work and get a little less shut eye to make the most of the hunt. To make every minute count, you need to know how to take that shot as last legal light approaches. Do you have the gear to maximize as much light as possible? Can you see far or well enough to determine if that’s a trophy rack or a stack of branches? Here’s a few to tips to bowhunting in low light conditions to think about the next time you put camo on! It makes sense to get a lot of practice sessions done in low light conditions before attempting to take a shot in these conditions in the field. How can you expect to be ready to make a clean shot come low light if you haven’t exposed yourself to it before? It’s a reasonable question to contemplate. If you expect to wing it, expect to see your arrow fly and good luck finding it. Realistically, most hunters will walk away from the shot because “there’s not enough light.” Have you heard yourself say those exact words before? Don’t let low light be the end-all-be-all. Practice a lot, and make the most of first and last light. It’s also surprisingly satisfying when you see a dead-center shot that you took at 30 yards 5 minutes before dark. Practice and improve your low light shooting skills with your hunting gear and in the same position you would when out in the field, then you can certainly feel that much more confident come the hunt. Be patient. It’s easy to get restless when you’ve been out since first light and you’re starting to get antsy come low light. If you’ve done your leg work and you know the area, you’ll be better prepared to be flexible during the hunt. Monitoring your surroundings means having a good view of multiple directions where deer can sometimes come unexpectedly skittering through during the rut. Be prepared to move if it improves your vision, position, and chances of success. Monitor the wind. Knowing what direction the wind is moving can save your hunt. Keeping the wind in your face can be more important than the camo you’re wearing and good scent control. If might mean moving from your favorite stand to a different one when the wind changed at 6 pm. Ensure bow and arrow clearance from your stand. The last thing you need is for your arrow to sink into a branch or you rattle the branches from your stand coming to a full draw, both of which will be a sure miss. No, we don’t mean eat a lot of fiber. Even if you can see your target in low light conditions, can you see your pins? A bow sight with a lot of fiber optic has more potential to absorb and transmit as much ambient light as possible. 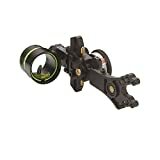 Some of the best bow sights have fiber optic material that wraps around the entire sight housing. If your sight doesn’t have a lot of fiber optic length, you can expect that your pins will be very dim at first and last light. No, we’re not talking about jean sizes. Pin size is an important factor to consider. During the day, it’s easier to see a .010″ pin that does great for those long distances, but can you effectively see it at low light? .019″ pins seem to be a good size for a bow hunter to still find the pin and not cover up too much of the target. Knowing what your effective shooting range is at low light will also help to determine what size pin you will prefer. You won’t know how far you’re willing to take a shot in the dark or what size pin you’ll want once the sun makes its way out if you haven’t taken Tip 1 seriously. A small peep does it for day hunting or competition shooting but it won’t cut it if you’re low light shooting or even night time hunting. The gist of it is, the larger the peep, the more light is allowed to your eye. But, of course, it brings up the debate of why use a peep at all. Unless you’re practiced at maintaining consistency in form and eye to sight alignment, the advantages of having a peep will outweigh the drawbacks. If you’re using the same bow for day and low/night time hunting, go up a peep size from your 1/8″ peep to a 3/16″ or 1/4″. You can even go with the wide aperture of a 5/16″ peep allowing in the most light and widest field of view to see your target better. Are your binoculars cutting it for low light? We’re not talking about the need to have extreme magnification. Instead, is your sight picture a blur at 5 am or can you see defining shapes and silhouettes clearly enough to determine that’s the elusive, feeding buck you’ve had your eye on for the last week? There are three key features to consider: glass quality, objective lens diameter, and exit pupil. Quality glass can mean everything from premium coatings to HD/ED elements to get the best contrast and sharpness in any light condition. A larger objective lens size typically means more ability for a binocular to transmit ambient light through to the eyepiece. A large exit pupil allows for maximum use of that transmitted light to be used by dilated eyes in low light conditions. A 7×50 bino can provide a brighter sight picture than a 10×42 if other parameters are equal such as glass quality. The 7×50 may have less power, but it has larger objectives to transmit light and a larger exit pupil to allow more light to be absorbed by the dilated human eye. How does your binocular measure up? It might be tempting to outfit your bow with sight lights, lasers, and night vision gear that can keep you out and in the hunt longer. However, many states in the USA ban any use of battery-operated or electronic devices being mounted or attached to your bow for hunting purposes. Before buying a bow sight, check to see that any included lasers, sight lights, or electronic and battery-operated attachments are detachable. You will also need to check what your local and state regulations are regarding these specific items and their allowed usage on a hunting bow. You can practice and plan all you want, but if your gut tells you not to take the shot, it’s best to trust your instincts. Sometimes, it’s just too dark or you can’t see good enough to make the ethical shot. Good hunting practices always come first. Speaking of ethical and moral hunting, we’re going to side track for a second to say it’s okay to lose sometimes. Not every hunt ends with a freezer full of meat, and it’s okay to let the many small bucks go. You only caught wind of your trophy rack a few times but it’s younger relative kept popping up all over the place. It’s okay to let him mature for another season or two since the elusive one you’re after didn’t get to be as big as he is because some eager newbie took him down as a yearling. Hunting in first and last light isn’t an easy task. It’s usually cold out, you have to be in position well before game can suspect you’re there, and it requires a lot of patience while remaining constantly alert of your surroundings. Sounds like fun, right? Embrace the challenges of low light hunting and you might find after all your practice and dedication that it will pay off and you’ve found your new addiction. It’s a good addiction to have!